Adjusted present value (APV), defined as the net present value of a project if financed solely by equity plus the present value of financing benefits, is another method for evaluating investments. It is very similar to NPV. The difference is that is uses the cost of equity as the discount rate rather than WACC. And APV includes tax shields such as those provided by deductible interests. APV analysis is effective for highly leveraged transactions. The adjusted present value approach is very similar to the Discounted Cash Flow method of valuation. So similar, in fact, that they will yield approximately the same results if the financing structure of a company is consistent. The method is especially effective in any situation in which the tax implications of a deal heavily effect the outcome, such as with a leveraged buyout. When compared to the more common methods of valuation, the adjusted present value method is newly created. When valuing your company, it’s important to identify the destroyers in your company. In the adjusted preset value (APV) approach the value of the firm is estimated in following steps. 1. The first step is to estimate the value of a company with no leverage by calculating a NPV at the cost of equity as the discount rate. 2. The next step is to calculate the expected tax benefit from a given level of debt financing. These can be discounted either at the cost of debt or at a higher rate that reflects uncertainties about the tax effects. The NPV of the tax effects is then added to the base NPV. 3. The last step is to evaluate the effect of borrowing the amount on the probability that the firm will go bankrupt, and the expected cost of bankruptcy. In the adjusted present value (APV) approach, the primary benefit of borrowing is a tax benefit and that the most significant cost of borrowing is the added risk of bankruptcy. In an APV valuation, obtain the value of a levered firm by adding the net effect of debt to the un-levered firm value. In the cost of capital approach, the effects of leverage show up in the cost of capital, with the tax benefit incorporated in the after-tax cost of debt and the bankruptcy costs in both the levered beta and the pre-tax cost of debt. These two approaches can get the identical results in theory. The first reason for the differences is that the models consider bankruptcy costs very differently, with the adjusted present value approach providing more flexibility in considering indirect bankruptcy costs whether or not it shows up in the pre-tax cost of debt. So the APV approach will yield a more conservative estimate of value. The second reason is that the APV approach considers the tax benefit from a dollar debt value, usually based upon existing debt. The cost of capital approach estimates the tax benefit from a debt ratio that may require the firm to borrow increasing amounts in the future. 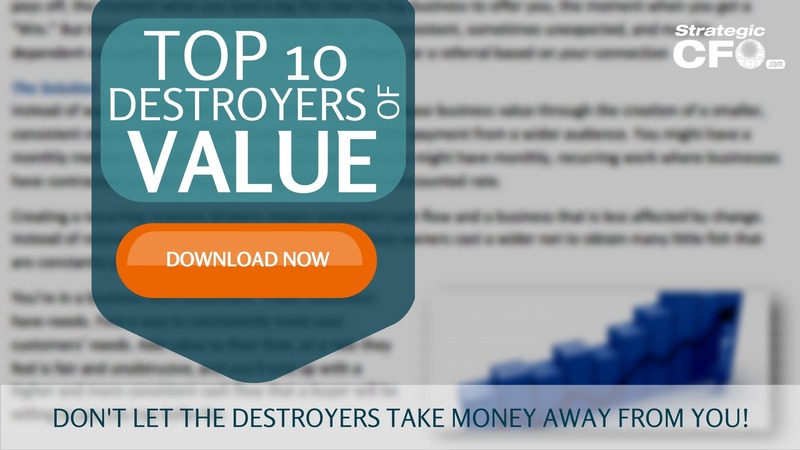 Download the free Top 10 Destroyers of Value whitepaper to learn how to maximize your value. The definition is being used by google but it cuts off the last section of the paragraph. Google shows: “The adjusted present value is the net present value (NPV) of a project or company if financed solely by equity plus the present value (PV) of any financing benefits, which are the additional effects of debt.” This is misleading because APV is used when a project is highly leveraged…you mention that in the paragraph but it is cutoff on the google definition. Is there a way to adjust the article to address why and when it is best to use APV first then describe the how…I understand the use but some of the people I work with can’t get past the line that says it is for a project “financed solely by equity”. So they think APV is used when it is 100% equity financed and never get to the last line in the paragraph. Thank you so much for making this clear. Well, I’d like to hear more from you. 2)To use a statistical approach, such as probit, to estimate the probability of default, based on the firm’s observable characteristics (excessive debt ratios, declining income, poor project returns, small market capitalisation etc) at each level of debt. Its important to note that it may be because of the complexities of estimating the probability of bankruptcy that the APV method may not be as more popular in practice as the other DCF methods. In addition, ignoring the cost of bankruptcy may give you different results that can conclude that your optimal debt ratio (the debt ratio at which value of firm is maximized) is 100%, whereas this may not be the correct level.